A Lieutenant Colonel assigned to a Camp Pendleton helicopter squadron has become the highest ranking Marine to die in Iraq. Lieutenant Colonel David S. Greene, a reservist from Shelburne, Vermont, died Wednesday from wounds shortly after his gunship was hit, Major Randy Parker said yesterday. No other Marine Lieutenant Colonel has died in Iraq since the war started March 20, 2003, according to Pentagon casualty records. Four Army officers of that rank have died. 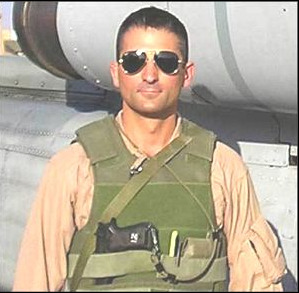 Greene, 39, also was the first fatality for Helicopter Light Attack Squadron HMLA-775 during Operation Iraqi Freedom, Parker said. Several unit members have been wounded. The helicopter unit is based at Camp Pendleton, but Greene served at the unit's detachment in Johnstown, Pennsylvania. "He was a star," said Parker, who is stationed in Johnstown and knew Greene. "The Marines who worked for him loved him." Greene was liked because he was approachable and had a good sense of humor, Parker said. The aviator is survived by his wife, Sarah, and two children, Wesley, 8, and Jenna, 10. "They're a picture-perfect family," said a neighbor, William Hogan. "Dave was a hard-working father, husband and family man." The close-knit enclave of 10 homes on the shore of Lake Champlain was "stunned and shocked" after military personnel arrived Wednesday afternoon to inform Sarah Greene of her husband's death. Few details about his death were available yesterday. Greene's gunship was one of two flying Wednesday afternoon in Anbar Province, the Sunni enclave west of Baghdad that has been a hotbed of insurgency attacks, when he was fatally wounded. The helicopter's co-pilot landed the damaged Cobra. Several Marine outposts had come under small arms and mortar fire and several airstrikes were ordered. It was unclear from military sources whether Greene was flying one of those missions. After graduating from the U.S. Naval Academy in 1986, he went to flight school. He was on active duty from 1986 to 1997 and participated in Operation Desert Storm in 1991. He joined HMLA-775 about five years ago, said Parker, who had met Greene while they were on active duty and serving in North Carolina. Greene continued to list Raleigh, North Carolina, as his home town. Besides his duties as a pilot, he was the squadron's maintenance officer, overseeing the repair of the unit's AH-1 Cobras and UH-1 Hueys. The Cobras, armed with rockets, guided missiles and a rapid-fire Gatling gun, are primarily used for close air support. As a civilian, Greene had was a program manager at the Goodrich facility in Vergennes, Vermont, for nearly four years. He managed a group that worked on fuel and maintenance diagnostic systems for the Cobra. "Dave was not only a colleague to us, he was truly a friend," said Harry Arnold, a Goodrich division president. David S. Greene had a penchant for mischief making. One day, after training at helicopter flight school, he decided to do something about a pesky pine tree that was blocking the afternoon sun. Roommate David Weir recalled how Greene and another pilot just cut the tree down. "This thing crashes. It knocks down four or five other trees," Weir said. "He walks back, sits down and grabs his beer, and says, `I solved the problem, didn't I?'" Greene, 39, a Raleigh, N.C., native who lived in Shelburne, Vermont, died July 28, 2004, when the helicopter he was piloting was hit by ground fire. He was based at Marine Corps Air Station Miramar, California.